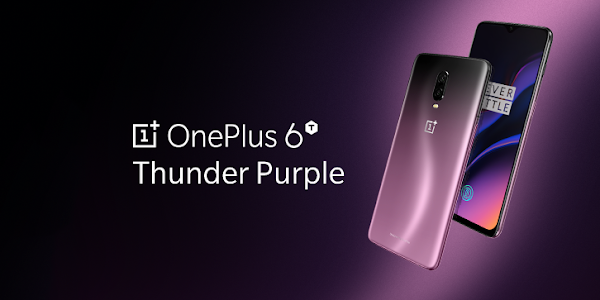 OnePlus is launching a new color variant of the OnePlus 6T - Thunder Purple, which according to the company is inspired by nature’s exquisite purple in storm clouds. Besides the color change, it packs the same powerful hardware including the Snapdragon 845 chipset, dual camera setup and in-screen fingerprint scanner. The OnePlus 6T specs include a 6.4-inch display, 128GB of internal storage, dual (16MP+20MP) rear cameras, a 20MP front camera, in-display fingerprint scanner, a 3700mAh battery, and a Snapdragon 845 chipset with 8GB of RAM. On the software side, you get Android 9 Pie based OxygenOS running things. It retains its flagship-killer status by offering this powerful hardware at a very affordable $550 price. The new Thunder Purple variant will be available November 15, 2018, across Europe and North America. With T-Mobile being the exclusive carrier for the OnePlus 6T in the US, we would have liked to see a Magenta OnePlus 6T offered by the un-carrier.